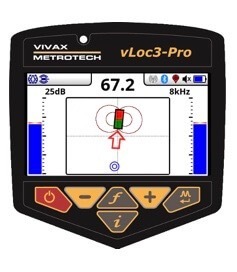 The vLoc3-Pro from Vivax-Metrotech is the new industry bench mark for utility locating. 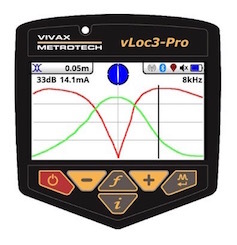 The vLoc3-Pro is built on a new Triaxial 3D architecture that provides "must have" features and offers powerful best-in-class performance. It's bold stance, curved silhouette and its class leading 4.3" color LCD high visibility display provides a locating refinement that has never been seen before in the marketplace. 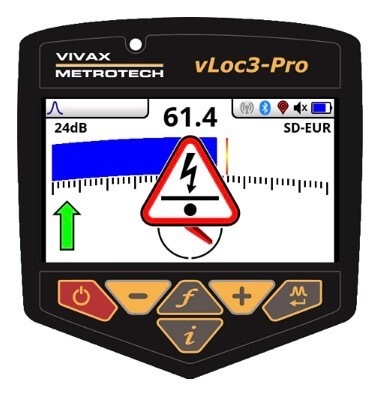 It's class exclusive 3D antenna technology is optimized to deliver an immense level of performance, allowing the technician to be in complete command on every challenging locate. 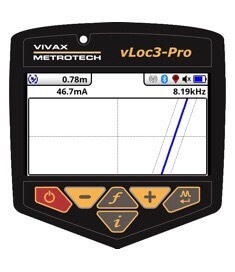 The vLoc3-Pro is as smart as it is tough, making it the perfect locator for the locating professional who wants to perform at their best. The classic mode with Peak (bar-graph & numeric indication) and Null (left/right arrows) with automatic depth & signal current and Compass (line orientation). Distortion is indicated by bar-graph color. 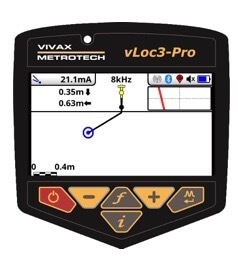 Vector mode locks onto the utility itself and displays orientation of the locator in relation to the utility. This mode provides lateral offset locating. An ideal mode for joint trench scenarios. Plan View mode allows for the utility to be located by following the actual path displayed on screen. This mode is the simplest mode for locating any utility. 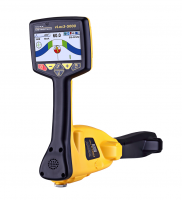 Transverse Graph Mode provides a perfect screen for troubleshooting a difficult locate. 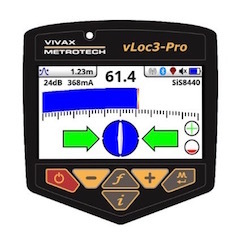 Sonde Mode on the vLoc3 allows technicians to approach the sonde from any direction. 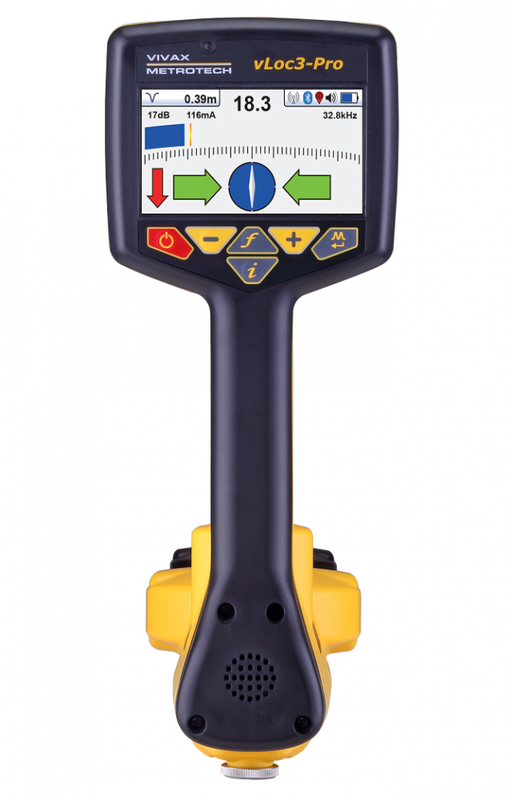 An arrow will guide users to the sonde and allow easy pinpointing. Warnings and Alerts provide users with instant feedback when something is wrong. These events will cause the handle to vibrate as well as display a visual notification indicating type of alert. All events are logged onto an internal SD card for future reference. This warning occurs when the utility detected is less than (6) six inches deep. This can prevent damage from occurring to the utility and provide user safety. This warning indicates that signal is being detected from above. This alert can prevent inaccurate utility marking. This alert activates when the locator is being used improperly. 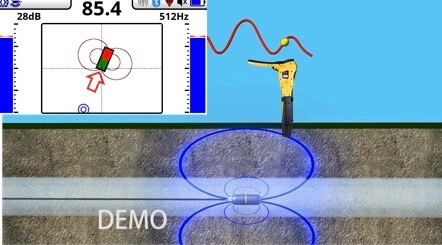 This alert allows users to learn how to swing the locator properly. The alert indicates excessive amounts of electromagnetic signal detected. E.g., near power transformers, etc. This alert can prevent inaccurate utility marking. Display Transmissive 480 x 272 Pixel, 16-bit Color, High Visibility, LCD, 4.3"